Learning at Suneden is underpinned by our school motto of Learn, Grow, Shine. We believe that all students can learn and grow, and our aim is for all students to shine as they reach their individual potential. We value the positive relationships webuild with our students and their families, and aim to provide a caring, safe and happy learning environment. We adapt sections of the Australian curriculum to plan meaningful, relevant and engaging learning experiences for the students, with an emphasis on communication skills, physical and emotional well-being, independence, literacy and communityawareness. We are a multi-disciplinary school that employs a Speech Pathologist, Occupational Therapist and Music Therapist to work in an integrated model within the school. They provide advice and ideas for our staff to weave therapeutic strategies for individual students and for class learning throughout the school day. We also use a number of Suneden programs to support student learning including our ‘Suneden 5’ values, and our ‘Keeping Safe at Suneden’ protective behaviours curriculum. 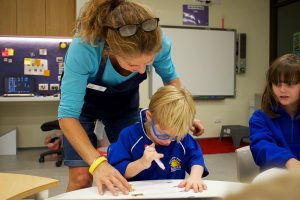 Our teaching is always responsive to the specific needs of the students in each class, with teachers carefully taking into account the needs, interests and abilities of the students when planning learning experiences. Enrichment activities further enhance student learning with students participating in a range of activities both within the school and in the community. These include swimming at Minda and Marion pools, shopping, visits to local cafes and restaurants, Variety Club movies and parties, participation in Special Olympics events, visiting authors during Book week celebrations, visits to local libraries and parks, participation in Australia wide events such as Music: Count Us In and visiting sporting instructors. Each student also has a Negotiated Education Plan (NEP) which is developed in partnership with parents and school staff. The NEP allows us to set priority goals for each student and these goals are then planned for, implemented and reviewed throughout the year.